I am always amazed at the juxtaposition in conversations shared between groups of intellects and groups of stoners. 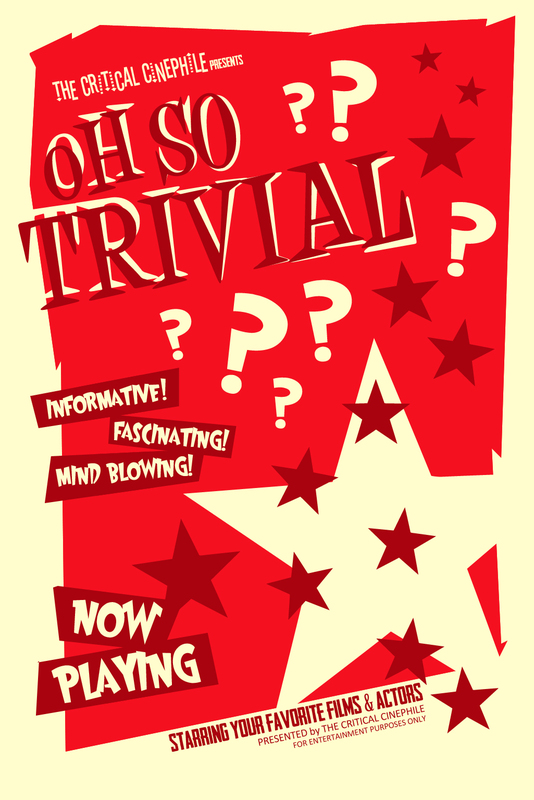 Comparatively, the subject matter in both factions generally consists of mind bending concepts and theories, with the participants engaging in hideous displays of grandiloquence (for instance; juxtaposition, comparatively, and grandiloquence). Where the two parties deviate is in the presentation. Intellects eloquently advocate free thinking in order to share knowledge, expand theories, and promote new ideas. Stoners dig the whole free thinking thing, but in doing so liberally use words like “dude” or “man”, engage in long pauses between thoughts, and have snacks. Lots and lots of snacks. 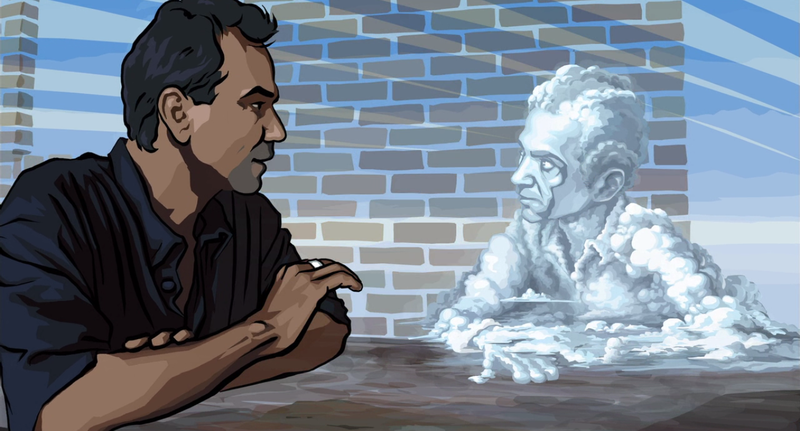 Waking Life is one of those films that cater to either side of the free thinking table. As one who has participated in dialogs from both sides of this proverbial table, the first thirty minutes of this film brought into question my four-plus years of sobriety. Boat/cars, language as symbols, telescopic evolution, what…is happening right now? My program tells me to abstain from all mind altering substances, and this movie my friend; this movie is a mind altering substance. And then the monkey spoke of doubt. A chimpanzee (voiced by Austin, TX photographer, musician, and writer, Steve Fitch) is speaking about a narrative of doubt; referring to a history unable of being told through ordinary language, but instead uses gestures and action to convey its message. These visual cues are not merely a means of creating art, but a vehicle of communication. And in a cinematic epiphany I knew he had just described this film. This movie hasn’t just been a series of stylized, talking heads regurgitating random theories, but an intelligently structured cypher for decrypting The Dreamer’s code. Is he dreaming? Is he dead? Am I dreaming? I’m fairly certain I’m not dead. At the end of his lecture, the chimp literally eats his own words and we are prompted to “begin again at the beginning”. So I did. At the beginning of the film The Dreamer has a vision of his own youth. He revisits the profound experience of seeing a comet for the first time, and in that perfect moment of wonder he is offered an opportunity of ascension. Now at this point it’s important to mention that when I refer to ascension I’m not necessarily speaking of any particular religion’s ascension, but merely ascension to a higher being of self; a gain in knowledge through experience if you will. But due to either fear, ignorance, or doubt (whichever state we reside in that keeps man’s mind stagnant), the young boy remains tethered. The Dreamer then awakens to find himself riding on a train. His journey has begun. At the train station The Dreamer is approached by the boat/car driver. It’s here that the driver is actually offering to be his guide. He is a means to present The Dreamer with what his expectations should be for this experience. The driver explains that the name of his vessel is See-Worthy; meaning everything that will be offered up to The Dreamer will have value and meaning. He further explains that although The Dreamer may not initially understand or agree with everything presented to him, in this dream, just as in life, he should pretty much just go with the flow and accept that it is what it is. The Dreamer is then dropped off at a seemingly random spot chosen by fate (or in this case the passenger riding in the boat/car with him, who also happens to be the writer/director of the film). He is told this spot will determine the course of the rest of his life, and upon arrival, he is immediately killed by a car. At one point The Dreamer encounters a man seated at a table who tells him, “The quest is to be liberated from the negative, which is really our own will to nothingness. And once having said yes to the instant, the affirmation is contagious. It burst into a chain of affirmations that knows no limit. To say yes to one instant is to say yes to all existence.” Perhaps what he is saying here is that the The Dreamer’s level of acceptance is equal to his level of serenity. Until The Dreamer is willing to say yes, to accept each of life’s happening, good or bad, only then will he be fully “awake” to experience, and the peace that comes from enlightenment. From here I could tick off chronologically all my thoughts on each of the concepts presented; but I believe that would be counter intuitive to the individual’s experience of the film. We as free thinking human beings each experience and find meaning in the world differently. A big part of the message of this film is how we allow our individual experiences to shape and define who we are. How the integration of each singular experience creates our own narrative. Most of the ideas presented in this film have existed for centuries. One of the overwhelming themes addressed is the importance of living in the moment. The guy talking about turning the light on in dreams (John Christensen) tells The Dreamer, “Maybe lucid dreaming should be a metaphor for how to exist waking; that we should always be awake and aware of our constructing reality at every moment, and awake to all its possibilities.” Later, the man on the bridge (Timothy “Speed” Levitch) says, “That so many think because then happened, now isn’t. But didn’t I mention? The on-going wow is happening right now.” Being present in and fully experiencing the moment is a Buddhist concept that has been around since 500 years before Christ. But even if an idea has existed for centuries, if it’s new to the individual then it’s received as a revelation. By the end of the film The Dreamer has come full circle and finds himself in front of the same house where his dream experience began as a young boy. He is once again given the opportunity for ascension. The Dreamer initially resists, trying desperately to cling to his old ideals he feels keep him safe and grounded. But armed with his newly gained knowledge he eventually concedes and allows himself to accept his experience. He has said yes to this one instant. His affirmation bursts into a chain of affirmations that know no limit, causing The Dreamer to drift infinitely upward, ascending to a higher being of self. Is he allowed to awaken? Has he accepted his own death? Each of us as viewers (in essence we are The Dreamer) will have interpreted these encounters differently, so it’s appropriate that his fate is ambiguous. The individual viewer’s perception is allowed and encouraged to be uniquely their own. Waking Life is one of those films that is not simply watched, but experienced. This movie is not for everyone. Hell, even The Dreamer didn’t initially understand what was going on and described his encounters as, “A lot of people, a lot of talking. You know, some of it was kind of absurdist, like from a strange movie or something.” But to those who didn’t “get it” the first time around, I encourage you to revisit the journey viewed through the theoretical goggles of someone who did. Be willing to say yes to the instance of this film. Perhaps you just may discern a few metaphorical breadcrumbs on the path to traversing your own waking life. Just…wake up. This entry was posted in Animation, Drama, Essays and tagged ascension, awakening, Buddhism, dreams, drugs, epiphany, fate, film, free will, movie, philosophy, theory, Waking Life. Bookmark the permalink. We should probably skip out on that cocktail suggestion I sent your way – sorry!! No apology needed. I may be sober, but don’t ever deny me the opportunity to live vicariously through the boozing of others! I’m totally down for cocktails…I just take mine unleaded [I also relish in partaking of anything “virgin”. -giggity-].